Quite a run of shows in Charleston of late, like this one and this one, and that doesn't even include a Lucero show last Sunday that, due to a weekend event that required two consecutive 15 hour workdays, I regrettably passed on. But Andrew Bird was a can't miss for me. Not even another lengthy day on the job and an early morning in waiting could keep me from catching Andrew's set at the Music Farm in downtown Charleston, SC. Opening the night was St. Vincent, aka Annie Clark. The indie darling released a fairly successful record this year, of which I've heard maybe half and was fairly unmoved. But she seems like a viable act, though didn't demand punctuality, as the crowd was fairly thin when I arrived halfway through her set. I found her music to be a little more engaging live, although she as a performer appeared uncomfortable and stiff. Petite, pale, and topped with a mossy thicket of raven curls, Clark appeared reluctant--even disinterested while on stage. She hardly moved, save for a slight upper-body twitch akin to the movement of the second hand of a wristwatch. Prior to her last song--and I may not have heard this correctly--but I could have sworn she said "Andrew Bird is next, and he'll be a lot better than me." Pity grabs are unflattering, always. Let's hope I misheard her. Bird didn't take long to appear, clad in a ratty suit and looking every bit like a struggling dictionary salesman with his five o'clock shadow and thinning coiffure. and the band set into "Fiery Crash" from 2007's stellar Armchair Apocrypha. The set was heavy on new material, from this years Noble Beast. But he didn't shy away from the last two albums either, playing a handful of material from both Armchair and The Mysterious Production of Eggs. Highlights included the anthemic "Fake Palindromes" and "Tables and Chairs" from Eggs, "Plasticities" and "Cataracts" from Armchair, and "Fits and Dizzy Spells" and "Not a Robot, but a Ghost" from Noble Beast. They also played a Bowl of Fire tune, which was Bird's band from the late 90s. The night's finest moment came during the encore, with St. Vincent joining Bird and crew on stage and performing "Scythian Empire", an Armchair song that starts out as a starlight stroll, and blooms into a full-on meteor shower, textured by swirling galactic lights and Bird's soaring vocals throughout. It's hard to describe Andrew Bird without it sounding gimmicky. "He's a really, really good whistler. He plucks his violin and loops it and then plays xylophone while he whistles, and he'll loop that and switch to guitar. Yes, his name is Bird and he whistles." 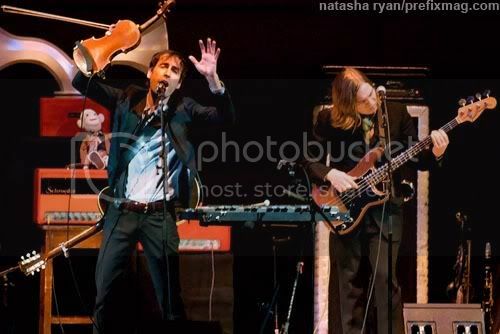 Andrew Bird toes the line of gimmickry, albeit in a different way than, say, the Decemberists. His lyrics generally aren't anachronistic, and he ostensibly doesn't adhere to a singular concept in his albums. But he does seem to crave a depth in his music that a simple guitar-bass-drums-vox attack can't provide. And rather than amass an army (or, more fittingly, a flock) of minstrels, the entrepreneurial Bird would rather just do it himself. So we see him juggling his arsenal, flanked by three relatively sedated band mates. At one point, Bird complained of a fever he'd picked up in New Orleans, but I wouldn't have known if he hadn't have said it. I went into this show without lofty expectations. "Singer-songwriter guy has a band, stands at a mic and plays, bounces around a bit, sings the songs and looks cool doing it" kind of sums up what I thought was in store. But Bird is much more than that--he's a classically trained musician and passionate showman to boot, much like Tom Waits. 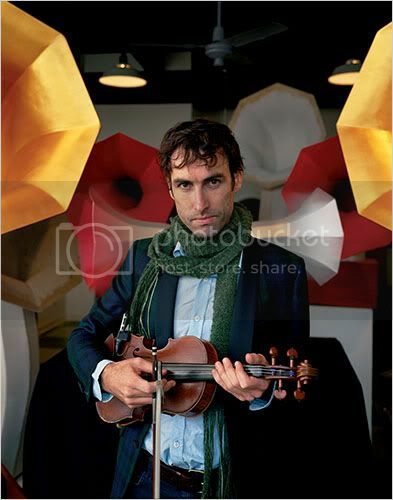 In fact, what with his whistling and ethereal vocals, Andrew Bird is like the angel to Waits' growling devil. Someone, quick, book the tour!